2. What stores near me carry the GapShield? The GapShield™ is currently available at Cabela's, various online vendors, or directly through our Internet site. Check back to see as localized dealers are added to our distribution network. 4. How is the GapShield™ different from other products designed to keep debris out of the tailgate gap? The GapShield™ is made out of an extremely durable and flexible elastomeric material, proven through years of use in many automotive OEM applications. The width and geometry of the GapShield™ was designed to bridge the gap between the tailgate and bed for almost any truck design, including when various bedliner accessories are in place. The high strength adhesive strips take a lot of abuse and still maintain a good bond. When loose material is not being transported, the free end of the GapShield™ can be tucked in to the gap, keeping it out of the way of other truck bed chores. 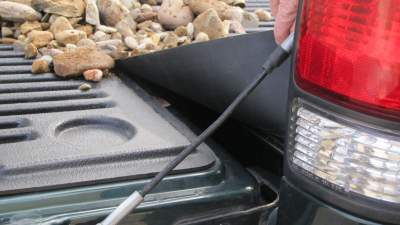 When tucked in the tailgate gap, the GapShield can also provide a very nice seal, either to keep very fine cargo, like seeds from falling through or keeping road dust from creeping up into your truck bed. No, the GapShield™ easily attaches to your truck with full-length high grade automotive adhesive strips, so no holes for mechanical fasteners are necessary. Although the adhesion of the GapShield has been tested on various truck bed surfaces (painted, plastic bedliner, spray-on-liner), your specific situation may be different and trucks with spray on liners need the most care to bond correctly. 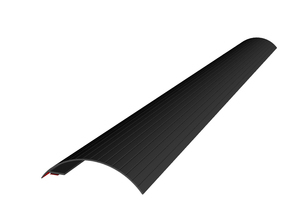 In addition, some plastic bedliners are corrugated and have limited flat bonding area. In these cases, if possible, install the gapshield adhesive end under the lip of the bedliner for a more secure attachment. A packet of "adhesion promoter" is included with your GapShield to further enhance the bond strength. Be careful when powerwashing the bed, as a direct high pressure water stream may compromise the adhesion. 6. Is installation of the GapShield™ easy? Of course the ease of installation depends on the skill level of the installer, but this is certainly on the "easy side" when it comes to installing an aftermarket product. Nevertheless, please read the installation instructions and carefully follow them for best results. Remember, those adhesive strips bond strongly, so try your best to get it right the first time. You can take a look at the installation instructions here. 7. Will the GapShield™ work in extreme hot or cold weather? The GapShield™ has been tested for functionality between -30C and 80C. However, why would anyone be working in weather like that anyway?! Nonetheless, the GapShield™ will not be damaged in most circumstances specifically due to the temperature. However, the material and adhesive tape will become more flexible/soft at extreme high temperatures and will tend to stiffen at low temperatures. Thus, on extremely hot days more care should be taken not to pull directly on the GapShield™. Additional measures, may need to be taken if this becomes an issue for you. Please call customer service and we'll try to help. In low temperature situations, you will mostly just notice it will take a little more time for the GapShield™ to lay flat when the tailgate is first opened. If this becomes a hindrance to you, simply tuck the free end of the GapShield down in to the tailgate gap and pull it out when needed. In almost all circumstances, this will not interfere with closing your tailgate. In fact, in this position, the GapShield provides a very nice tailgate seal. When the weather warms up, operation will go back to normal.